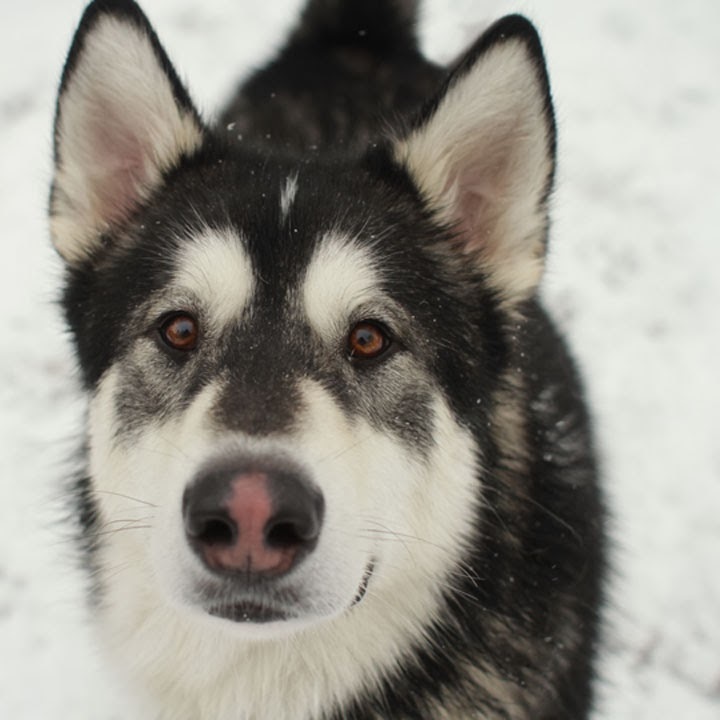 Sunday I went out to TAS West along with another volunteer, Rachael, to meet Malamute Nate and Malamute/Husky(?) Sara and spend some time with them, take some videos and photos of them. They've been at TAS West since November when they were found tied to a tree in a park and left abandoned there. TAS-W is hoping to adopt the two of them out together as they are a bonded pair. Rachael can tell you the rest. Sarah and Nate: Sounds like a romantic comedy but these bonded Malamutes are way more entertaining than Katherine Heigl and Mcdream-what's-his-face. If only their future was as predictable as a rom-com. These two beauties have been at TAS West since mid-November now. As a couple, they're having some difficulty finding a home for two. I grab Sara and Nate from their cages and head out for a walk and for some photos. A few love nips and some serious tail wagging later, we get to the door. 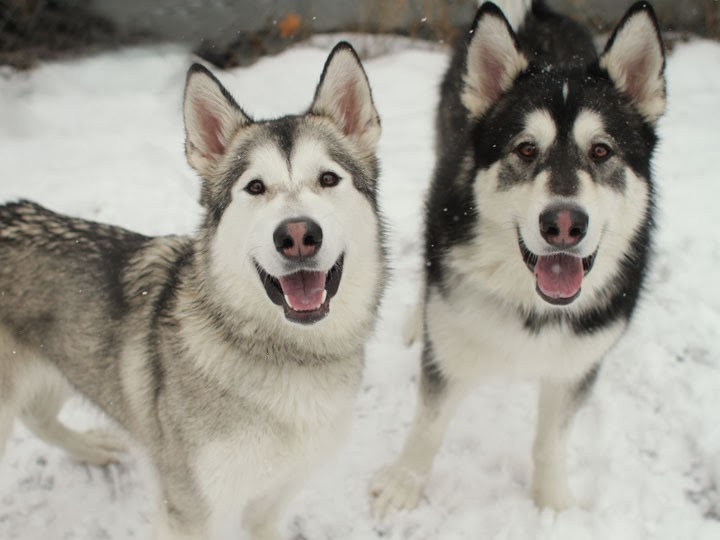 I open it to a flurry of snow and slush; these two couldn't be happier. I feel their relief as they give way to each other. 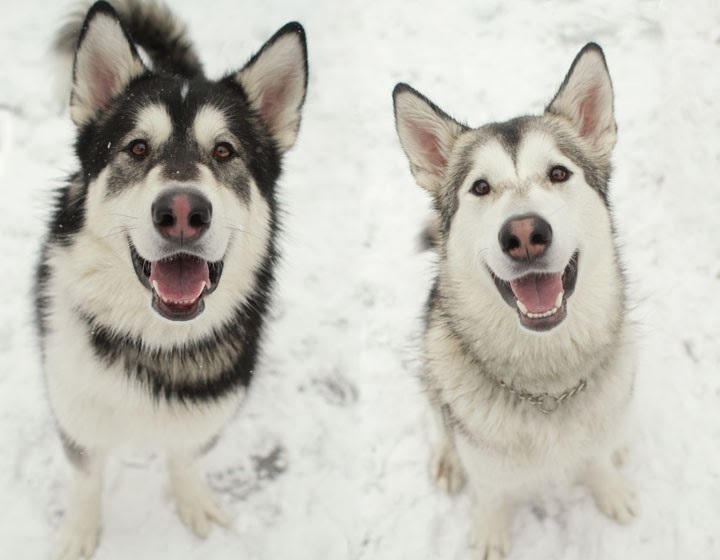 Tumbling and toppling over one another they make me envious that I will never experience the delirious passion for snow a Malamute feels. It's oddly encouraging as I battle the flu. Their excitement is infectious and I temporarily forget the growing numbness of my limbs - a feat considering I spend the winter in double jogging pants (yes, that is exactly what it sounds like). Joy is a Malamute and their best friend wrestling and kissing in the blustery heights of January. These gentle giants could make a winter lover out of even the grouchiest seasonal hermit. Walking both Nate and Sara. Yes, when they want to pull, they pull but for the most part, they're pretty good considering their size. Just a little training will go a long way with these guys. 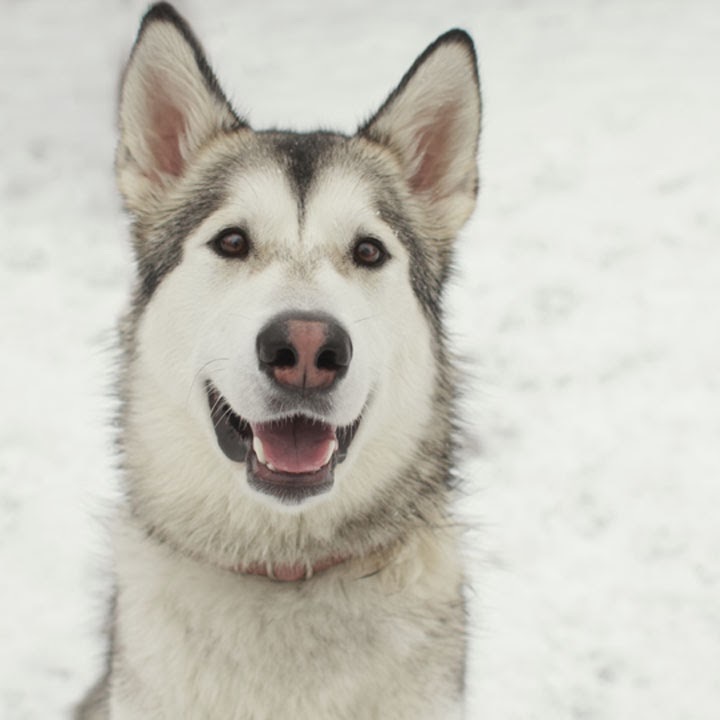 The best way to check on the adoption status of Nate and Sara (and other dogs and cats and other small domestic animals) is to visit Toronto Animal Services adoption website or call (416) 338-6271 for the Toronto Animal Services West shelter. If they are no longer on the TAS adoption website, it's probably because they've been adopted already. Oh my goodness! If someone can send them up to Northern Saskatchewan for me I would gladly take them both!! Wow, the fur on her collar almost exactly matches the fur on the dogs. It's great that she's helping these dogs out but so sad that she can't see that the animals used to make that coat deserve a happy life just as much as Nate and Sara do. Nate and Sara are so beautiful, with their smiling faces. I hope they find a wonderful forever home together. After suffering being abandoned once it would be too much to bear if the lost each other. I hope TAS works hard to keep them together! have they been adopted? how are they - any news? Anon, yes, they've been adopted. Update soon.